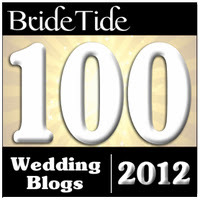 The Relentless Bride Blog was named one of the top 25 wedding blogs!!! Now, I'm sure you are thinking, but WAIT, don't you work with the great site Weddzilla.com? To be honest, my first reaction was to email our lovely Sara Morgan and say "Am I allowed to win this?" and she emailed me back "You did win fair and square, we double checked all our numbers!" ... And actually, that makes this award mean that much more to me because I didn't even think I could be voted in :) So thanks to all y'all who voted - and thanks Weddzilla.com for putting me on a list with amazing fabulous bloggers! Check out the Press Release below and a list of all the other fabulous blogs listed on the 2010 Guru Awards !!! Make sure to go and check them out!!! 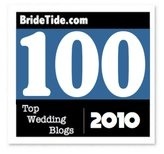 The Relentless Bride Blog named winner of Weddzilla.com’s 2010 Guru Awards Top Wedding Blog. Weddzilla.com, the first wedding website to create a more efficient way to connect brides and vendors, and fully integrate the wedding planning process into popular social networks, is excited to announce the winners of their first annual 2010 Weddzilla Guru Awards, hosted by their star-studded Weddzilla Guru Panel. Blogging has become an integral way that Nearlyweds and wedding professionals alike share ideas, find inspiration, and connect with each other. The Weddzilla Guru Awards recognizes the top 25 of these wedding blogs. Unlike other awards in which the winners are selected by the organization, the winners of the 2010 Weddzilla Guru Awards are selected based on votes from the Weddzilla community of Nearlyweds and wedding professionals from across the nation. The Relentless Bride Blog (http://www.relentlessbride.com) is a wedding planning blog that is evolving to cover not just wedding planning and all things wedding, but newlywed and married life. Starting from the moments of the initial planning, The Relentless Bride Blog has covered in detail every aspect of planning the wedding, honeymoon, showers and parties with descriptive script and tons of photos. A guide to any bride and insight into a newlywed’s daily life with all the quirks thrown in. For more information on the Weddzilla Guru Awards, please email Sara Morgan, Director of Marketing, at sara@weddzilla.com or call (800) 515-1930.